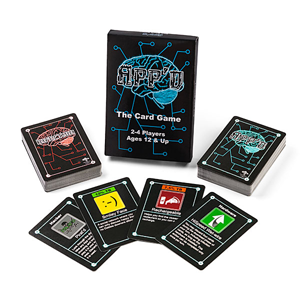 App'd is a futuristic card game for 2-4 players, where personal computing is done within one's brain. In this mad, advanced, future world people can upgrade their body's hardware, and download Apps directly into slots in their brains. Life would be easy if you could just download all you want without any problems but don't be fooled into thinking that your brain is a fortress. Dangers lurk everywhere. Beware of viruses, malware, worms, syntax errors, hackers and the like. Be the first player to avoid the pitfalls and download enough Apps to fill up 1 terabyte (TB) of your space in your brain without going over and you are App'd.